Promise – a declaration or assurance that one will do a particular thing or that a particular thing will happen. I think it’s safe to say that there is not one person in this world that hasn’t been affected by promises. 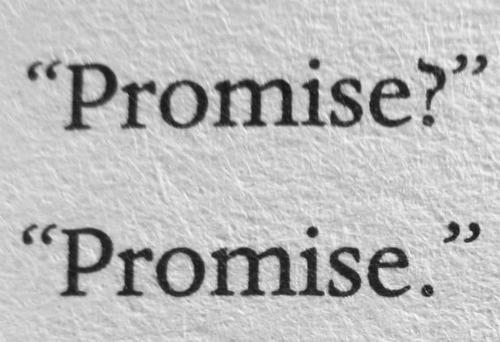 And by promises, I mean promises that have been personally made, or promises that others have made to you. Promises can be so significant. A broken promise can bring heartbreak, disappointment, distrust and sadness. But a fulfilled promise can bring joy, life, trust, and even strength into a relationship. I am sure that if anyone was asked the questions would you rather have a life full of broken promises? Or would you rather have a life full of promises fulfilled? The answer would be a life full of promises fulfilled. In this world because people are human, there is always the possibility that when they make promises, those promises may not be fulfilled. There are many reasons as to why some promises are broken. A person can forget the promise that they made. And, some promises are broken because a person chooses not to follow through. So, if that is the case does that mean that we will always have a life where broken promises are present? Yes, that can happen but, there is a way to live a life with promises being fulfilled. At first I thought to live a life filled with promises that have been fulfilled was a dream that was too good to be true. Until, someone began to show me otherwise. His name is Jesus. Jesus’ main purpose for coming to the earth and dying on the cross was not only to forgive us of the sins that we had committed but, it was also that He could give us life. He wanted to give us a life that was not just an ordinary life to be lived here on the earth but, a life that is lived to the fullest. A life overflowing with His goodness, blessings, favor, health, joy, peace and wholeness. Isaiah 9 speaks of why Jesus came. It says this, For a child has been born—for us! the gift of a son—for us! He’ll take over the running of the world. His names will be: Amazing Counselor, Strong God, Eternal Father, Prince of Wholeness. His ruling authority will grow, and there’ll be no limits to the wholeness He brings. The word wholeness means this, complete or full, not lacking or leaving out any part. Free of wound or injury. Recovered from a wound or injury. When Jesus came, He came to restore our lives so that we might walk in His wholeness. So that we might walk in all of the inheritance that He has for us. His Joy, Peace, Righteousness, Health and the list goes on. It is His desire that we are whole in every area of our lives and are experiencing all of the inheritance of what He died for us to have. In Romans 8 it says, This resurrection life you received from God is not a timid, grave-tending life. It’s adventurously expectant, greeting God with a childlike “What’s next, Papa?” God’s Spirit touches our spirits and confirms who we really are. We know who He is, and we know who we are: Father and children. And we know we are going to get what’s coming to us—an unbelievable inheritance! He wants and desires to give us an unbelievable inheritance. I know that this can seem too much like a fairytale. I had a little bit of a hard time believing that God wanted to bless me with an unbelievable inheritance. A life that is filled with life and life more abundantly. Then God repeated to me the phrase in this scripture. “God is not a man, that He should lie, nor a son of man that He should repent.” Then I thought what, does the word repent mean? It means this, to change one’s mind. Then God showed me that when He promises me something He does not change His mind based on what I have done. He does not say I promise you and then take the promise back because I failed to do what is right. What He said He would do, He will do. Why? Because it says in 1 Corinthians 1:20 Jesus says yes to all of God’s many promises. It is through Jesus that we say, “Let it be so,” when we give thanks to God. Because I have invited Jesus into my life, I have been made in right standing with Jesus. Every promise that God has for me I can have. All I have to do is believe Him and say let it be so. It’s that simple. Wow! How amazing is that? When you invited Jesus into your life, you have been made right with Jesus and all you have to do to receive His promises is believe Him and say let it be so. Indeed this is a fairy tale that has come true! I would like to end with this last verse in Hebrews 6. This is just another example of how much God wants to pour out His promises into our lives. You too, may have struggled in the area of wondering if God would pour out His promises upon your life or, if He would withhold His promises from you based on your behavior. I have good news for you, all of His promises are Yes and Amen in Him and all of His promises are for you in this lifetime. Believe Him and watch as His promises unfold in your life. Know that they will exceed way beyond your highest expectations. You can trust Him!! He will never go back on His word!! He Is Forever Faithful! !